Here at Harvard Computing, we have a lot of discussions about Legends. 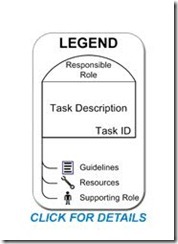 Many organizations go totally crazy about creating legends, many do nothing. In general, the general public are much more accustomed to legends. Most of this is not because we have been topographic experts while hiking some peak, but rather we interact with intuitive (and not so intuitive) icons every day. Every place we look we are faced with figuring out what this icon or symbol means. Here are few examples of where we will see them during the day. Using fewer symbols and ones that everyone can understand is the key to successful communication in any application, but particularly important in process mapping. The TaskMap model has been adopted by so many organizations not just because we are a bunch of clever folks that understand the problems of process mapping (although that might be true! ), it’s because it is simple and it works. When you add legends to your maps, make them clear, link them to examples and think “Self Service” when you receive something to read, you don’t want a grammar lesson, you want to read it.